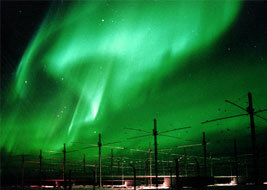 The High Frequency Active Auroral Research Program (HAARP) is the study of Ionospheric Physics and Radio Science. The goal of this program is to further advance our knowledge of the physical and electrical properties of the Earth’s ionosphere which can affect military and civilian communication and navigation systems. 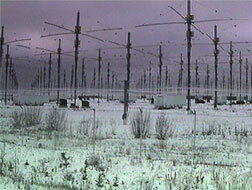 The HAARP research facility is located in Gakona, Alaska. The HAARP program, which began in 1990, is jointly managed by the Air Force Research Laboratory and the Office of Naval Research. Gakona, Alaska was chosen as the site for the HAARP program because it is the only State that is in the auroral region. Auroral means: phenomenon occurring in the night sky around the Polar Regions, caused by atmospheric gases interacting with solar particles to create streamers, fold, or arches of colored light. The HF transmitter system used at HAARP produces approximately 3.6 million watts of radio frequency power. It is designed to operate linearly so that they will not produce radio interference to other users of radio spectrum. HAARP draws only housekeeping power from the local power grid, used for lighting, hearing, and computers. During research operations, the HAARP facility is taken off the local power grid completely. An Environmental Impact Study was conducted by the National Environmental Policy Act and concluded that all of the significant environmental impacts associated with building and operating the HAARP Observatory can be mitigated to an acceptable level. They also concluded that there are insignificant impacts to the habitat, socioeconomic, and wildlife that may not be mitigated. HAARP also claims that the facility will not affect the weather. Transmitted energy in the frequency ranges that will be used by HAARP is not absorbed in either the troposphere or the stratosphere. Electromagnetic interactions only occur in the near-vacuum of the rarefied region above about 70km known as the ionosphere. Since the ionosphere is a turbulent medium that is being both “stirred up” and renewed by the sun, artificially induced effects are quickly obliterated. HAARP officials also claim that HAARP research cannot create a hole in the ionosphere. Nor are there any locations on-site or off-site where the E-M fields exceed safety standards for RFR exposure ad defined by IEEE/ANSI C96.1-1992 and NCRP Report No 86. They state that in fact, the E-M fields measured at the closest public access to the site are lower than those of most urban environments. There are many conspiracy theorists and environmentalists that have their own ideas about the HAARP project. Some believe this weapon has the capability to manipulate the environment in such a way as to change weather patterns, disrupt global communications systems, disrupt human mental processes, negatively affect health, and impact the Earth's upper atmosphere in an unnatural and damaging way. By interfering with the Earth's magnetic field there is no assurance that damage on an irreversible global scale will not occur. HAARP can steer the upper atmosphere with a focused electromagnetic beam, capable of moving what's commonly known as the jet stream. It is an advanced model of an "ionospheric heater." (The ionosphere is the electrically charged sphere surrounding Earth's upper atmosphere. It ranges between 40 to 60 miles above the surface of the Earth.) This modification can thereby change weather patterns from one area to another. Put simply, the apparatus for HAARP is a reversal of a radio telescope; antenna’s send out signals instead of receiving. HAARP is the test run for a super-powerful radiowave-beaming technology that lifts areas of the ionosphere by focusing a beam and heating those areas. Electromagnetic waves then bounce back onto earth and penetrate everything -- living and dead. To make matters even worse, the United States is not alone in this weather control/modification technology and research. Russian and other governments are involved in their own research projects. By no means is weather the only result of Tesla technology, earthquakes, hurricanes, floods and volcanic action can be created, induced with this same HAARP technology. But where the discussion of chemtrails and HAARP manage to converge is in the creation and distribution of the chemically enhanced grids. Planes spread their effluvia creating grid patterns over our skies filling the planet with toxins that would enable the HAARP emissions to flow into the grid affecting radar capabilities, the weather, and various form of mind control. These compounds (metallic in nature) release within chemtrails are ideal for blocking/deflecting (or at least reducing) microwaves or electro magnetic effects etc. Whilst this still could be for the purpose of reducing the effects of Global Warming, it could also have some benefit in shielding a potential attack from a HAARP device in another country. Without more information or proof, we can only speculate. It is not beyond the realms of possibility that we are already witnessing a war, a war that does not involve conventional weapons, but a device that creates "natural" disasters that can be equally devastating. Could it be the one who controls the earth's weather, controls earth? Also some of those who have investigated HAARP are also concerned about other applications employing microwave technology that can be used as "mind-control" weapons over civilians. Our Earth as well as every living creature resonates to a natural frequency pulsation called the ‘Schumann Resonance’, which is equivalent to 7.8 Hz. These are quasi-standing extremely low frequency (ELF) waves that naturally exist in the earth’s ‘electromagnetic’ cavity, the space between the ground and the ionosphere. These ‘earth brainwaves’ are identical to the spectrum of our brainwaves. The ionosphere is now being manipulated by US government scientists using ELF waves from HAARP, manipulating and disrupting human mental processes through pulsed radio-frequency radiation over large geographical areas creating mood changes with the possibility of mentally enslaving whole populations with the twist of a few dials. Our brains are extremely vulnerable to any technology which sends out ELF waves, because they immediately start resonating to the outside signal by a kind of tuning-fork effect.